These tips can help you get the most out of your new Lutema Avatar Hovercraft. Your 4-channel Avatar Hovercraft is fun to fly but if you’re a beginner you’ll need to give yourself some time to master the remote control and certain maneuvers. With a bit of practice you’ll be flying your RC helicopter like a pro in no time at all. Your 4-channel Avatar Hovercraft is easy to fly. If you’re new to the world of Lutema RC Helicopters and if this is your first machine, take some time to get used to the remote control. You’ll want to master certain basic maneuvers. These instructions are compatible with models MIT4CAVHB and MIT4CAVHR. Since lithium batteries can heat up quickly, be sure to monitor your helicopter when the battery is recharging. When you’re waiting for the battery to be recharged, get your space ready. Move any objects out of the way and may sure you have enough clear space to fly the helicopter without running into anyone or any objects. Before starting to fly, get your remote helicopter is set up properly. Make sure the Lutema RC helicopter is turned off and the remote control throttle is all the way down. This is ensure the helicopter doesn’t fly off randomly before you’ve taken control. 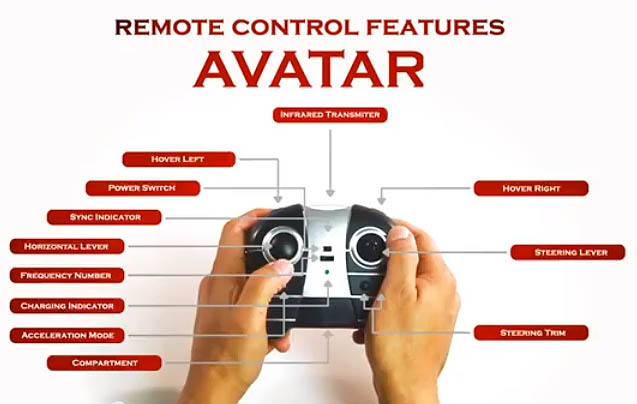 Your Lutema Avatar Hovercraft remote has three main controls. Throttle (horizontal lever): The left hand control stick is the throttle that controls the height of the R/C helicopter. To make the remote helicopter gain height, push the throttle all the way up. To make the RC helicopter descend, push the throttle all the way down. Direction (steering lever): The right hand control stick controls direction of the RC helicopter. Move the stick to the right and the R/C helicopter moves in a clockwise direction. Push it to the left and the remote helicopter will spin in an anti-clockwise direction. Trim: The trim button stops any uncontrolled movements. Moving the trim button to the right stops the remote helicopter from spinning off in a clockwise direction. Moving trim button to the left corrects the R/C helicopter from spinning counter-clockwise. Practice keeping the Lutema Avatar Hovercraft at a constant and stable altitude. Switch the helicopter to ON. The lights will start flashing. Place the helicopter on a flat surface with nothing in its way. Use the right trim button to stop uncontrolled clockwise spinning. Use the left trim button to stop uncontrolled counter-clockwise spinning. Land the helicopter by slowing releasing the throttle stick. The helicopter will slowly descend. 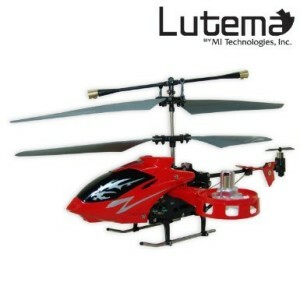 Repeat the procedure until you can get the remote Lutema R/C helicopter to fly smoothly. Push the throttle stick up and stabilize the remote helicopter. Press the direction stick to the right to move the R/C helicopter forward. Not too far to the right because the remote helicopter will just spin rather than moving forward. Move the direction stick to the left and practice moving the remote helicopter counter clockwise. Move the direction stick to the right s0 the remote helicopter starts flying in clockwise circles. Keep practicing these moves until they come automatically to you. You’ll soon be flying the Lutema Avatar Hovercraft like a pro in no time at all. Click on the photo or link below for a video on more flying tips.